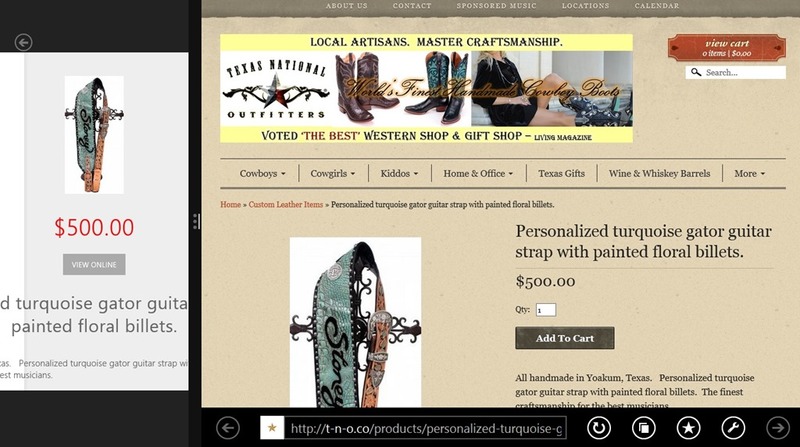 My Cowboy Boots – TNO is a free Windows 8 Shopping App. You can use it to find Best Deals On Leather and other handmade products from TNO (Texas National Outfitters). You can also see the full specification of the products that are available here. Plus that, you can view the product online. Share what you see and find, using the Windows 8 share Charm. 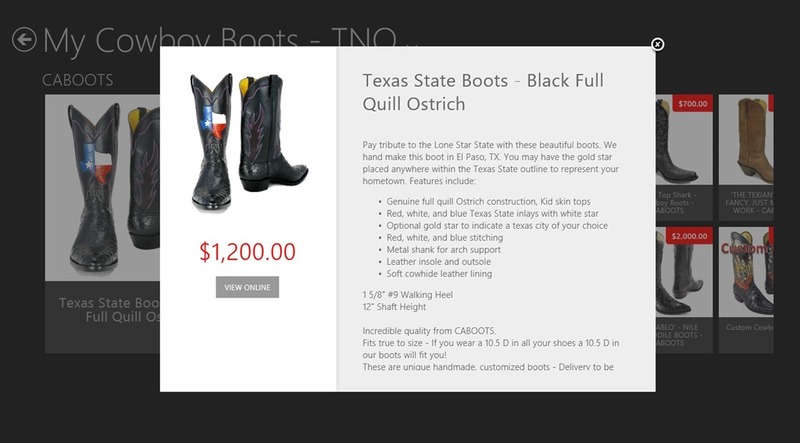 My Cowboy Boots – TNO is freely available in the Shopping category of the Windows Store. The app get its name from the world famous Cowboy Boots which are one of the main attractions from Texas National Outfitters. In addition to Cowboy Boots, this app will provide you with deals on other products like Bible Covers, Art, Boot Care products, Cowboy Shirts, Guncases, Guitar Straps, and many other stuff available from Texas National Outfitters. As you land into My Cowboy Boots – TNO, a number of categories will appear to you. From the available categories are some like Cowboy Boots, Cowboy Shirts, Guncases, Guitar Straps, and many other stuff. As you choose the category in this Windows 8 Shopping app, you can see all the products that are available under that category. The products that will appear here, will be shown as tiles with their price and some details like their dimensions. When you open to view a particular product available in this Windows 8 Shopping app, it will open up in front of you with good specifications like its size, any other feature you might want to know about before buying it. If you are satisfied with what you see in this Windows 8 Shopping app, then you can buy the product online. For this, you can use the View Online option, and this Windows 8 Shopping app will open it up in the IE app of your Windows 8 enabled system. From there, you can easily buy the product. Also there is an ability to share these items using the Windows 8 Share Charm. Also Check Zappos and Deals Near Me. Choose from a number of products from Texas National Outfitters. Free: This Windows 8 Shopping app is freely available in the Windows Store. Availability of the functionality to buy. According to my experience, I think the app is quite nice. A large number of categories are available in it. Try it for sure and share your experience with us. Get My Cowboy Boots – TNO here.